Sugar is one of the world's most traded commodities. The chart below uses annual sugar prices reported by the World Bank and average annual gold prices to show sugar prices in USD cents/kg and gold mg/lb. I find it interesting that volatility (when priced in gold) declines substantially after 1971, when the USD was allowed to float on the world market against gold. 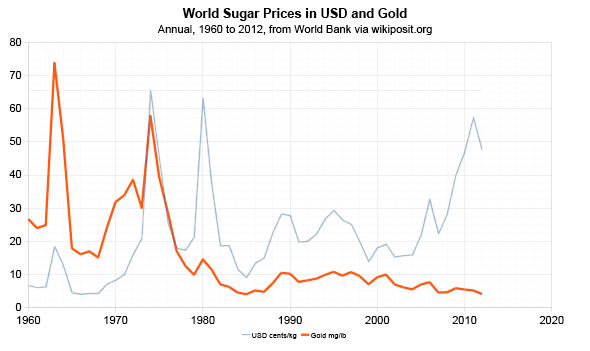 Note also that although sugar prices have more than tripled in USD terms since 1999, they have declined by about 50% in gold terms.